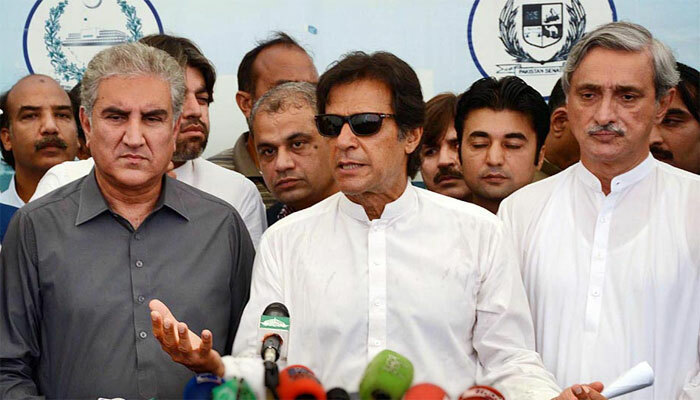 File photo of Imran Khan at a press conference with Shah Mehmood Qureshi (left) and Jahangir Tareen. The differences between Qureshi and Tareen, two heavyweights of PTI, are not new. It is a power struggle. Qureshi represents one school of thought in the party while Tareen another. Both want to infiltrate the party with their respective loyalists so they can solidify their position and influence in the party. While theoretically, differences of opinion are part and parcel of democracy and lead to healthy competition, highlight flaws in system so they can be fixed, and promote meritocracy overall; however in reality, it is bad news for Tehreek-e-Insaf. It is bad news because each group will try its level best to undermine the other in the eyes of Imran Khan and party members, so that they can leverage their own benefits. Even if it meant making sure the candidates supported by the opposing group lost their respective elections, they will not hesitate to do so, as long as it serves their purpose. It will be personal victory for one group, but defeat for Imran Khan.